Make homemade corn tortillas topped with margarita marinaded carne asada and salsa fresca. I recently spent two weeks in San Francisco and had the pleasure of sampling quite a variety of flavorful dishes, from high end restaurants to casual take out kitchens. One of my favorite meals was from a simple restaurant called Street Tacos in the Haight Asbury section of the city. Here’s my interpretation of the carne asada tacos that I enjoyed so much. 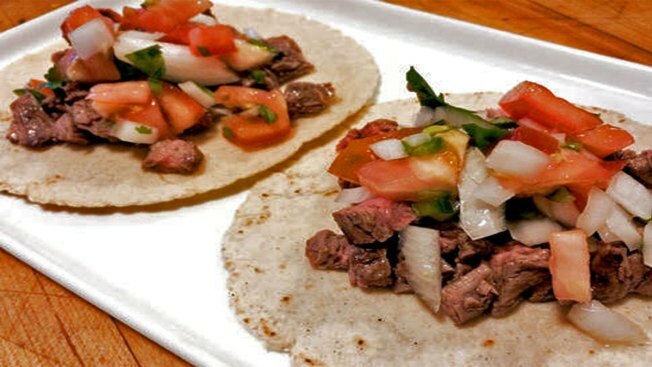 The homemade tortillas are really easy to make and the marinade for the skirt steak will really give the tacos a little extra kick. I hope you enjoy them. Lay skirt steak on a flat surface. If the steak still has a thin membrane on one side (called the silver skin), peel it off the steak using a sharp knife and discard. That extra skin will make the meat tough and chewy. Using a meat tenderizer, flatten the steak a bit on both sides and then transfer it to a large disposable bag. Meanwhile, pour water, salt and brown sugar in a pot and bring to a boil. Stir until ingredients are fully dissolved. Remove from heat and allow to cool completely. Then, add the garlic, the zest of one of the limes and the juice of both, tequila, triple sec, black pepper, chili powder, and cumin. Whisk in the olive oil and pour marinade over steak. Remove as much air as possible from the bag and seal it. Refrigerate for for 4-24 hours. To cook the steak, remove it from the marinade and pat it dry with paper towels. Season with a bit of pepper. Heat a sauce pan over high heat. Add about 1 tablespoon of olive oil and the steak. Cook the steak for about 1 to 1 1/2 minutes per side for medium rare, or loner for your desired doneness. Remove from heat and place on a cutting board and let it rest for about 2-3 minutes. Separately, make the salsa fresca by mixing together tomatoes, onions, jalapeño and cilantro in a large bowl. Season with salt and set aside. Slice and chop skirt steak into 1/4” cubes. Place tortillas on serving plates. Top with steak and salsa fresca. Squeeze a bit of lime over the filling and serve. Mix together corn masa, salt and adobo seasoning. Add 1 3/4 cup water, plus 2 tablespoons, and blend. The dough should not be too moist. You should be able to press it into a ball, but it shouldn’t be sticky. Open the tortilla press and place plastic wrap on both surfaces. Roll some of the dough into about the size of a golf ball. Place on press and smash down a bit. Close press fully to flatten tortilla. Open press and peel tortilla from the plastic. If the tortilla comes off in one piece without sticking to the plastic, then the moisture ratio is good. If it does stick, place the tortilla back in the batch and add about 2 tablespoons or so of masa. Mix and try again. If the mix works well, then divide the remaining dough into 11-13 equal portions. Preheat a flat skillet over hight heat. Place the first flattened tortilla into the skillet. Cook on one side for about 1 to 1 1/2 minutes. Flip and cook on the second for about 1 1/2 minutes. The tortilla might puff up a bit, but that’s fine. Place tortillas in a tortilla warmer or wrap in a tea towel and place inside of a covered casserole dish until ready to use. Repeat with remaining dough. If you’re not eating them immediately, store tortillas in an airtight disposable bag, squeezing out as much air as possible before sealing, and refrigerate.